Our qualitative research captures valuable info about the user exp. We originally focused on the youth market to learn about the user experience. Now we use qualitative panel research and social media tools to listen and capture valuable information that can help your product development, marketing and sales. Our Silicon Valley high tech experience allows us to quickly analyze and recommend action items for your team. 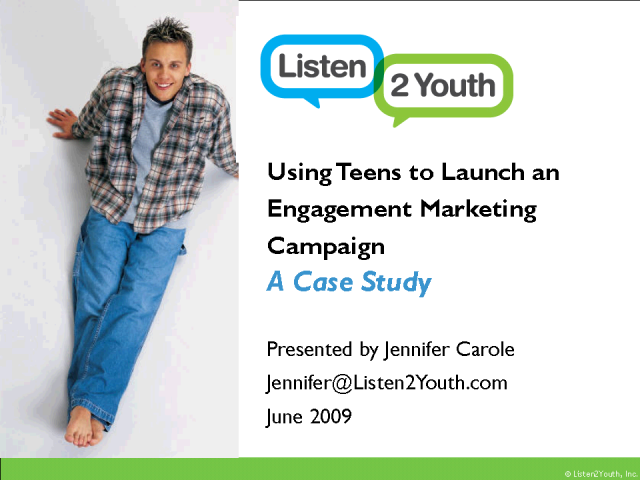 Jennifer Carole, Principal, Listen2Youth, Inc.
Based on a recent engagement marketing effort, we'll talk about the power of using young people to help you test your B2C marketing efforts. We had a lot of fun and gained some tangible insights by using our youth panel. Planning a new campaign? We'll share those insights with you.